Here you can enter a static subject of your choice; this will be used for every email sent by this button. The subject can also be determined dynamically from the value of a data field. To do so, click on the "Field" checkbox, and select the required data field from the drop-down list. Select the view page you want to send from this list. The values of the current data record will be applied automatically. Please note that all recipients of the email will need to have read access to the page. If the intended recipient does not have read access to the page, then the email will not be sent. Opens a dialog where the parameters, which the page requires, can be edited. If this option is selected, the email will be sent in HTML format. With that format, buttons that link to pages from applications can be added. If this option is selected, the values in the view and edit fields will be displayed in text format, and separated by tab stops. If this option is selected, all line breaks will be removed, and the complete text will be placed in the subject, and it will be sent via SMS, if sending SMS messages has been configured by your telecommunications service provider. Selecting this option will query the email address of the current user from the Users module and enter it as the sender. If this option is selected, the email address of the person defined as responsible for the application will be entered in this field. This refers to the user who saved the application last. This option allows any static email address you choose to be entered. 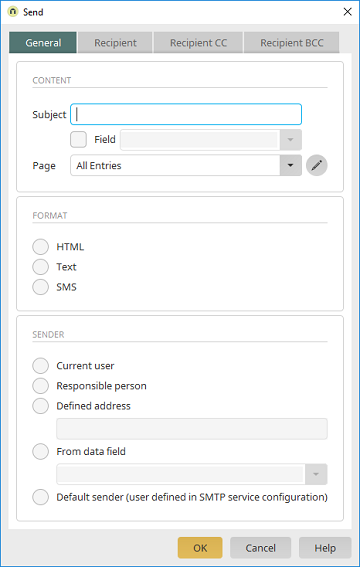 This option allows a data field to be entered as a dynamic sender list. With this setting, the user that is defined in the email service settings in the Tools module will be used as sender.